Ephron wrote romantic comedies for smart women, about smart women, with characters who had both bite and vulnerability to them. This July 27, 2009 file photo shows director and writer Nora Ephron, left, and cast members Meryl Streep, center, and Amy Adams pose together at the premiere of "Julie and Julia" in Los Angeles. Ephron blazed a trail in a male-dominated industry. Before Nancy Meyers, before Sofia Coppola, before Julie Delpy and Kasi Lemmons and Nicole Holofcener, there was Nora Ephron. She was a rare woman writing and directing in what was (and still is) the male-dominated industry of filmmaking. Ephron staked out her spot on the cinematic landscape with a distinctive voice and formidable wit. Now, she leaves behind a legacy of classic moments and quotable lines after succumbing to leukemia Tuesday at age 71. The very mention of her name calls to mind a certain kind of movie, something you can't say about many filmmakers, regardless of their gender. They were romantic comedies, yes, but ones for smart women, about smart women, with characters who had both bite and vulnerability to them. Maybe they were a tad too hyper-analytical or neurotic but they were always highly verbal and, more often than not, destined for the kind of happy ending they deserved. Meg Ryan forged and reinforced her status as America's Sweetheart with roles in movies Ephron either wrote or wrote and directed: The best of these was 1989's "When Harry Met Sally ... (directed by Rob Reiner)," followed by "Sleepless in Seattle" in 1993 and "You've Got Mail" in 1998, both with Tom Hanks in winning form as Ryan's likable everyman co-star. Decades later, you can still say the line, "I'll have what she's having," and everyone will instantly know what you're talking about. That's how lasting Ephron's work has been and will remain. Back in the late '80s and early '90s, Kathryn Bigelow was a rare fellow female filmmaker — and since has gone on to become the only woman to win an Academy Award for best director, for "The Hurt Locker" — but she's focused on action pictures. Barbra Streisand also tried her hand at directing around this time with "Yentl," ''The Prince of Tides" and "The Mirror Has Two Faces." But Ephron continued on and endured, for better and for worse. If we're being honest, some of her later work didn't come close to the level of her best-known and best-loved films. "Hanging Up" from 2000, which she and sister Delia co-wrote and star Diane Keaton directed, felt shrill and slapsticky. "Bewitched" (2005), a big-screen version of the 1960s sitcom which she directed, wrote and produced, seemed like a gimmicky strain. 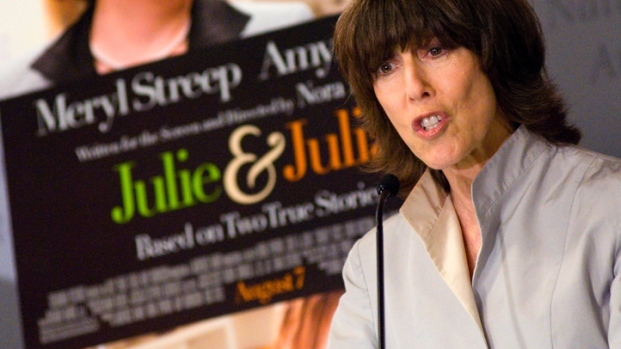 But her final film, 2009's "Julie & Julia," ended her career on a stronger note. Ephron directed Meryl Streep to one of her 17 Academy Award nominations for her joyous, pitch-perfect portrayal of pioneering chef Julia Child. And it was Streep who would play a version of Ephron herself in one of the earliest films she wrote, 1986's "Heartburn," based on her own scathing novel inspired by her marriage to Washington Post reporter Carl Bernstein. Ephron herself was a three-time Oscar nominee for the screenplays she wrote or co-wrote for "When Harry Met Sally ..." and "Sleepless in Seattle" as well as for her first produced script, for 1983's "Silkwood," directed by friend and frequent collaborator Mike Nichols and again starring Streep in the real-life nuclear drama. Looking back on the A-list names listed in this piece, it's a real testament to her talent that high-quality actors and filmmakers were drawn to her and wanted to be associated with her again and again. And we haven't even mentioned Billy Crystal, Carrie Fisher, Jack Nicholson, John Travolta, Steve Martin, the list goes on. Click here to see celebrity tributes that have poured in. It's that kind of singularity of voice and vision that sets an example for filmmakers to come — both male and female.